A regular breeding resident and migrant; the Upland Sandpiper was an uncommon species during the Minnesota Breeding Bird Atlas (MNBBA). The Upland Sandpiper’s breeding range extends throughout the Great Plains, from the Canadian Prairie Provinces south to northern Oklahoma and east through the Ohio River valley and the Great Lakes states. Scattered populations are also present in Alaska, northwestern Canada, and western New England. The core of its distribution is in the northern Great Plains of the United States (Figure 1). Ranked as a species of Least Concern by the U.S. Shorebird Conservation Plan Partnership and assigned a Continental Concern Score of 11/20 by Partners in Flight. The Upland Sandpiper is designated a Species in Greatest Conservation Need by the Minnesota Department of Natural Resources and a Target Conservation Species by Audubon Minnesota. A long-distance migrant that winters in southern South America. Primarily small invertebrates and a small amount of weed seeds. A shallow scrape on the ground that is lined with vegetation; some vegetation may be shaped to conceal the nest from above. Breeding distribution and relative abundance of the Upland Sandpiper in North America based on the federal Breeding Bird Survey, 2011-2015 (Sauer et al. 2017). To recite the history of the Upland Plover [Sandpiper] in Minnesota is to tell a sad tale of the wanton destruction of a valuable and once abundant bird that resulted in its almost complete extermination. Sixty years ago it was present all through the summer everywhere in the open country in countless thousands. Now it is a question of whether the remnant left can be saved even with careful protection. Because the sandpiper is a tasty bird, its destruction was hastened by the demise of the Passenger Pigeon in the 1880s. Anxious to continue satisfying the insatiable demands of eastern markets for game birds, the market hunters aimed their guns instead at Upland Sandpipers (Forbush 1912). Roberts wrote that stories of eastern market hunters killing the sandpipers “in great numbers” and shipping them east were common even in Minnesota. This killing coupled with the prairie’s conversion to agricultural lands led to the sandpiper’s rapid decline in the late 19th and early 20th centuries. The species virtually disappeared from the southern region of the state between 1895 and 1900. Although populations persisted in west-central Minnesota and in the northwestern aspen parklands, their numbers were greatly reduced. Gradually, very gradually, the depleted ranks were recruited, and since about 1920 it has been once more in evidence throughout much of the former range, but, except in the regions referred to above, the scattered breeding pairs are but lone reminders of the former thousands. Not only had market hunting taken thousands of birds, but now much of the species’ former prairie habitat had been converted. However, the sandpiper’s ability to adapt to the landscape’s new hayfields and pastures enabled it to regain some of its former numbers. It even occupied small portions of north-central and northeastern Minnesota in areas where extensive forest cover had been cleared for farming operations. Accounts of the Upland Sandpiper’s distribution by Green and Janssen in 1975 and by Janssen in 1987 further documented the species’ recovery. By now, the species was a regular breeding species throughout the state with the exception of the northeastern and north-central regions, where it remained relatively scarce. It was equally uncommon in Kanabec, Mille Lacs, and Pine Counties. Janssen’s (1987) breeding distribution map included all but the northern corner of the state defined by a line from eastern Lake of the Woods County south to southern St. Louis County. Its scarcity in southeastern and south-central Minnesota also was noted. Janssen identified 25 counties where nesting had been confirmed since 1970. Hertzel and Janssen (1998) later identified a total of 28 counties, but 4 counties originally identified by Janssen in 1987 were not included: Cottonwood, Itasca, Olmsted, and Ramsey. Although the species was found in scattered locations throughout the state, its primary distribution was restricted to the extreme western region of the state, from Rock County north to Kittson County. More intensive survey work to delineate the Upland Sandpiper’s distribution and abundance began in 1987 with the initiation of the Minnesota Biological Survey (MBS). Designed to systematically survey the state’s rare plants, rare animals, and native plant communities, the MBS included the Upland Sandpiper among a host of rare prairie fauna that were the focus of its early efforts. A total of 545 breeding season locations were identified, the majority in the late 1980s and 1990s. Although the species was found statewide, the western grasslands in the Prairie Parkland and Tallgrass Aspen Parklands Provinces were the primary core of the species’ breeding range in the state (Minnesota Department of Natural Resources 2016). More than 20 years after the MBS work began in the western prairies, the MNBBA was launched. During the 5-year atlas survey, participants documented 349 Upland Sandpiper records in 5.3% (251/4,760) of the surveyed atlas blocks and in 5.8% (136/2,337) of the priority blocks. Breeding evidence was documented in 20 blocks (Figures 2 and 3; Table 1). The birds were observed in 54 of Minnesota’s 87 counties (3 blocks straddled counties: Cass and Itasca (1 block), and Lac qui Parle and Chippewa (2 blocks)) and were confirmed breeding in 16 counties. Nine of the 16 counties are additions to Hertzel and Janssen’s 1998 map: Cottonwood, Jackson, Lyon, Otter Tail, Pipestone, Pope, Redwood, Yellow Medicine, and Watonwan. Seven of the new counties were restricted to southwestern Minnesota (Figure 2). Upland Sandpipers remain most abundant in western Minnesota, especially in Traverse and Lac qui Parle Counties in west-central Minnesota and throughout the southwest Prairie Coteau region and adjacent counties. The most notable change since the MBS inventories were conducted is the Upland Sandpiper’s distribution in the northwestern Tallgrass Aspen Parklands Province. The sandpipers were widely distributed in the parklands of Kittson, Marshall, and Roseau Counties during the MBS, but 20 years later they had virtually disappeared from large portions of this landscape. Today their distribution in northwestern Minnesota is restricted primarily to the Glacial Ridge area in Polk County and the Felton Prairie area in Clay County. The change likely reflects a major change in land use. For years, the region’s extensive grasslands were marginally productive, and commodity prices too low to warrant investments necessary to make the land productive, specifically the installation of tiling systems. But as corn prices increased in the early years of the 21st century, it became economical to convert these expansive grasslands to agricultural fields, thus changing the entire landscape and impacting an entire suite of grassland species. Today, Upland Sandpipers are found throughout much of their former North American breeding range but in significantly lower numbers. Nationally, the heart of the species’ range remains in the Great Plains, where the densest populations stretch from western North and South Dakota south into western Nebraska (Figure 1). Except for scattered remnants, the species is largely absent from or very scarce in the eastern portion of its former range, including Ohio, Indiana, Illinois, New York, and New England. In some of these areas mowed grass lanes found along airport runways provide the only remaining habitat (Houston et al. 2011). The Upland Sandpiper’s predicted distribution map (Figure 4) emphasizes the importance of the Prairie Parkland Province and closely corresponds to the relative abundance map generated from the federal Breeding Bird Survey’s (BBS) roadside data (Figure 1). Although scattered habitat is available throughout the Eastern Broadleaf Forest Province, the species’ predicted distribution in this region, as well as in the Tallgrass Aspen Parklands Province, is fragmented compared to the Prairie Parklands. Small, scattered patches of suitable habitat are also available in the western region of the Laurentian Mixed Forest Province. Densities are low, however, even in the most suitable habitat. Breeding distribution of the Upland Sandpiper in Minnesota based on the Breeding Bird Atlas (2009 – 2013). Summary statistics of observations by breeding status category for the Upland Sandpiper in Minnesota based on all blocks (each 5 km x 5 km) surveyed during the Breeding Bird Atlas (2009-2013). Summary statistics for the Upland Sandpiper observations by breeding status category for all blocks and priority blocks (each 5 km x 5 km) surveyed during the Minnesota Breeding Bird Atlas (2009-2013). Predicted breeding distribution (birds detected per 10-minute point count) of the Upland Sandpiper in Minnesota based on habitat, landscape context, and climate data gathered during the Minnesota Breeding Bird Atlas (2009-2013) using the General Linear Modeling method without an adjustment for detectability. The Upland Sandpiper is entirely dependent on grassland habitats. Originally confined to native grasslands, it has adapted to restored grasslands, grazed pastures, hayfields, Conservation Reserve Program (CRP) lands, and occasionally croplands, such as furrowed soybean fields, and open peatlands (Figure 5). The birds usually forage in shorter vegetation and nest and rear broods in taller vegetation that provides more cover. Habitat data collected within 200 m of MNBBA point counts where Upland Sandpipers were detected illustrate the species strong association with croplands (which includes pastures and hayfields) and upland grasslands (Figure 6). Suitable grasslands are characterized by low to moderate herbaceous cover, minimal woody vegetation, and moderate grass cover, with little bare ground (Dechant et al. 2002). The sandpipers tend to avoid extensive areas of tall grassland vegetation, preferring instead a matrix of different heights and cover densities. The ability to see over or through the vegetation appears to be important. A field study in Minnesota also found Upland Sandpipers using dry sites with relatively short vegetation, averaging 0.7 m in height (Hanowski and Niemi 1985). The heterogeneity of the habitat is significant and can be created by management practices that focus on periodic burning or mowing and moderate grazing. Fence posts or other display perches may be important components of suitable habitat. Generally considered an area-sensitive species, Upland Sandpipers usually prefer grasslands larger than 100 ha in size and are rarely found in sites smaller than 50 ha (Dechant et al. 2002). Typical breeding habitat of the Upland Sandpiper in Minnesota (© Gerald J. Niemi). Habitat profile for the Upland Sandpiper based on habitats within 200 m of point counts where the species was present during the Minnesota Breeding Bird Atlas (2009-2013). In 2006, biologists estimated the size of the North American breeding population at 350,000 breeding adults (Morrison et al. 2006). A more recent review of the population estimates of all North American shorebirds conducted in 2012 raised that estimate significantly to 750,000 adults, using data on breeding densities derived from the BBS (Andres et al. 2012). The majority of these birds occur west of Minnesota in the northern Great Plains. North Dakota and South Dakota support the highest breeding densities, with an average of 22 birds detected per BBS route each year in North Dakota, and 27 in South Dakota. In Minnesota, the average number of sandpipers per BBS route is only 1 (Sauer et al. 2017). As for most land birds, the BBS is the most robust source of range-wide population data available. Since the survey began in the 1960s, it has documented a relatively stable population with a nonsignificant annual increase of 0.40% per year, increasing since 2005 to 1.50% per year (Figure 7). The recent increase may be attributed to the popularity of the CRP, which began in 1985 and provides payments to farmers for retiring highly erodible or sensitive agriculture lands for 10 or more years. 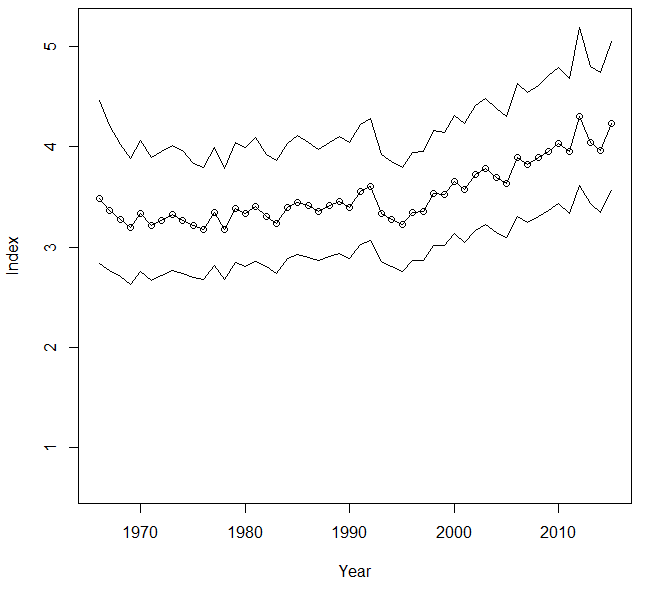 Contrary to the national trend, Minnesota BBS data document a decline of 2.40% per year. Because the sandpiper is very uncommon on BBS routes in Minnesota, the trend results are not as precise as they would be in areas of greater abundance. Nonetheless, changes in land use, particularly more intensive agricultural practices, coupled with a recent decline in the enrollment of CRP acres, are likely impacting sandpiper populations. Breeding population trend for the Upland Sandpiper in North America from 1966-2015 based on the federal Breeding Bird Survey (Sauer et al. 2017). The Upland Sandpiper has been the focus of several conservation planning efforts since the 1990s. Originally classified as a species of High Concern by the U.S. Shorebird Conservation Plan (Brown et al. 2001), a more recent assessment has downgraded the species to one of Least Concern, given its larger population size and increasing national population trend (U.S. Shorebird Conservation Plan Partnership 2016). Partners in Flight has assigned it a Continental Concern Score of 11/20, influenced largely by threats to both its breeding and wintering habitats (Rosenberg et al. 2016). A national conservation plan was prepared for the species in 2010 (Vickery et al. 2010). In Minnesota, the Upland Sandpiper was listed as a Special Concern Species in 1984, when the first state list was established (Coffin and Pfannmuller 1988). When the list was revised in 1996, the species was removed from the list because of the relative abundance of records documented by the MBS during the late 1980s and early 1990s (Minnesota Department of Natural Resources 1995). Regardless, as a grassland-dependent bird, it remains a concern to conservation organizations. The Minnesota Department of Natural Resources (2015) has designated it a Species in Greatest Conservation Need. Audubon Minnesota designated it a Target Conservation Species and prepared a statewide Conservation Blueprint for the species (Pfannmuller 2014). Continued concern is warranted. Despite the loss of more than 99% of Minnesota’s native prairies, the Upland Sandpiper is able to utilize a variety of altered grasslands that still provide suitable habitat. Their protection is very dependent, however, on the health of the agricultural economy. The CRP enabled the temporary protection of millions of acres of erodible farm lands for 10 years. But, as was evidenced in Minnesota’s Tallgrass Aspen Parklands Province, when commodity prices are high, there is less financial incentive for farmers to set aside these acreages and far more incentive to plant crops. In Minnesota alone, the number of acres enrolled in CRP in 2007 was 1.8 million acres, but in 2013, nearly 425,000 acres were no longer enrolled, for a loss of 23% (McDonald 2013). Site-specific management recommendations for the species focus on protecting large, contiguous tracts of grassland. Maintaining a variety of grass heights and densities by mowing, light grazing, and prescribed burning is critical. Only portions of a given site should be treated each year in order to protect dense cover that is essential for successful nesting and brood rearing. Reducing encroachment by woody species and providing perch sites (fence posts, tree stumps, or rocks) are also important (Dechant et al. 2002; Russell et al. 2016; Vickery et al. 2010). Unfortunately, habitat loss is not the only challenge for Upland Sandpiper populations. Like all shorebirds that winter in South America, Upland Sandpipers are still hunted, and the bird is still table fare in some Argentinian restaurants (Houston et al. 2011). And, as temperatures continue to rise, the sandpiper’s grassland habitat is predicted to become drier and be subjected to more variability in precipitation. Both outcomes can negatively impact nesting success. A preliminary assessment rated the Upland Sandpiper as having a medium vulnerability to climate change (North American Bird Conservation Initiative 2010). Clearly, close monitoring of this emblematic grassland inhabitant is warranted. Dechant, Jill A., Meghan F. Dinkins, Douglas H. Johnson, Lawrence D. Igl, Christopher M. Goldade, Barry D. Parkin, and Betty R. Euliss. (1999) 2002. Effects of Management Practices on Grassland Birds: Upland Sandpiper. Rev. ed. Jamestown, ND: Northern Prairie Wildlife Research Center. Forbush, Edward Howe. 1912. A History of the Game Birds, Wild-Fowl, and Shore Birds of Massachusetts and Adjacent States. Massachusetts State Board of Agriculture. Boston: Wright & Potter Printing Company, State Printers.